For all you coffee lovers out there, YOU’RE WELCOME. Here’s an easy DIY on how to create your own fantastic Harry Potter mug using nothing fancier than a permanent marker. Step 1: Purchase a mug (white is my personal preference, but any color will do). Make sure you thoroughly clean the outside of it because barriers of oil or dirt can cause Sharpie designs to run. TIP: Research suggests that the cheaper the mug, the better this works since the glaze used is generally inexpensive. Step 2: Grab your pencil (remember to use a colored pencil if you purchased a mug in a color other than white), and begin to stencil out your design. Get creative, and don’t be afraid to make mistakes! Drawing on a circular surface like a cup is very difficult, but that’s why we’re using pencil first. And don’t forget the handle! Lots of people add little details to the handle like tiny lightning bolts or Deathly Hallows symbols—nothing is off limits. Step 3: Once your design is all done, fill everything in with your Sharpie marker. You can use markers that are specially designed for ceramics if you really want to, but a Sharpie will work just fine. Just be cognizant of the fact that we’ll be baking our mugs, and some colors may end up fading (e.g., red may turn a bit yellow or orange). Step 4: Let your mug sit for at least an hour (I recommend letting it sit for a full day if you can bottle your excitement). This is to ensure that your Sharpie design has enough time to seep through any remaining oils on the surface of your mug and really bond with the mug. Step 5: Set your oven to 425 degrees, and bake for 30 minutes. Careful not to open the oven right up when done because we don’t want our mug to crack. Let the mug sit in the oven and cool off for around 15-20 minutes after the 30 minutes are up without opening the oven door. Once you’ve done that, open the oven door, and let the mug cool overnight inside the oven (this should help facilitate bonding the ink with the glaze of the mug). Optional Step: This step is optional, but once the mug is done cooling you can use clear nail polish or Krylon spray on your design to help protect it from chipping. Step 6: You’re all set! Just be sure to make every effort not to wash the cup in the dishwasher—hand-washing is strongly recommended. Remember to tweet us pictures of your new DIY Harry Potter mug! Check out our other tutorials on our Potter DIY page, and send your own instructions for an awesome DIY project to mugglenetdiy@gmail.com! 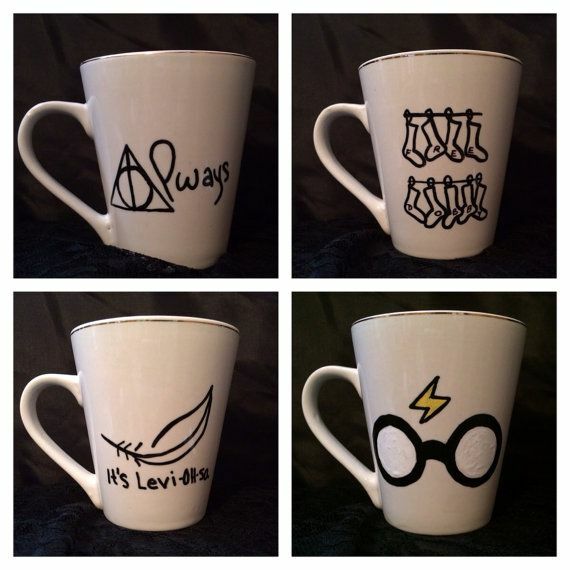 Tags: arts & craftsCoffeeCraftsDIYHarry PotterMugmugglenetPotter D.I.Y.